“Where are we?” asked Shane Connolly. I glanced around the small parking pullout, with ledges descending to Galway Bay on one side and a hill rising on the other. There was no “You Are Here” marker in sight. Shane reeled off the answer, the words flowing together and punctuated by a thick brogue. “The town is Murrough, in the parish of Ballyvaughn, in the old kingdom of The Burren, which is in the county of Clare, which is in the province of Ulster.” He pauses briefly, then gestured with his walking stick. “Down there is Morocco, over there is Berlin. Now you need to know that, because that’s the way we work in Ireland.” And with that, he handed me a walking stick and we started up the hillside. Perhaps, but it’s also a place of mystical, almost magical, beauty. Marked and unmarked roads weave by castles and holy wells, ancient forts and penitential stations in a landscape that’s equally barren and foreboding, yet spiritual and inviting. 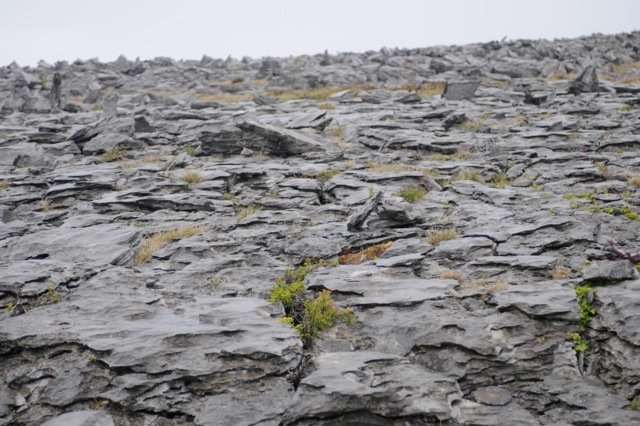 My first visit to The Burren, I’d explored randomly, aided neither by accurate map nor informed guided. This time, I wanted to understand the landscape, learn about the culture, and identify the flora and fauna. I needed a Land Whisperer. 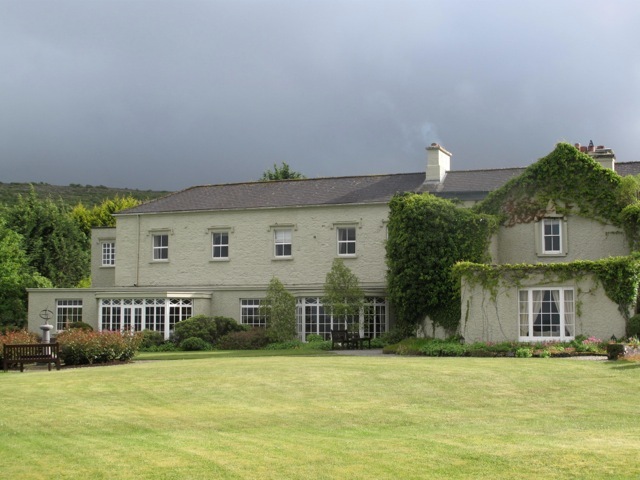 “You want Shane,” said Simon Haden, owner of Gregan’s Castle Hotel, an elegant Irish-Georgian manor, tucked in The Burren’s folds, just below the acurately named Corkscrew Hill, in Ballyvaughn. A sheep and cattle farmer whose roots here go back, “acch, forever,” Shane Connolly earned a diploma in archeology from the National University of Ireland, another in local and regional studies from University College Cork, and has a passion for sharing not only book-learned facts but also oral tradition. 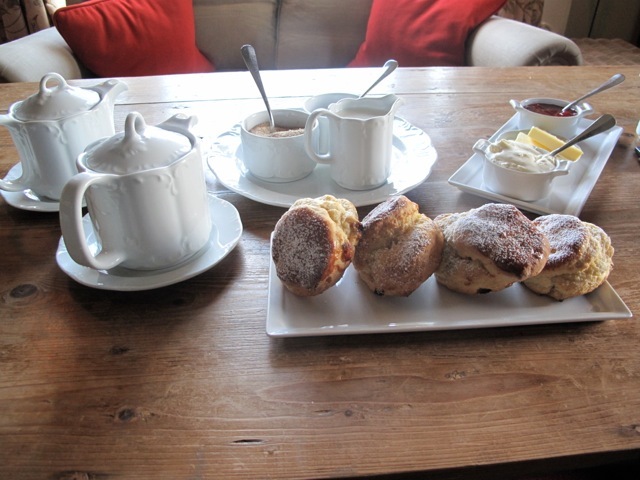 As I savored tea and scones slathered with clotted cream and jam, Simon phoned Shane’s Burren Hill Walks and arranged a half-day ramble up Black Head. Within minutes of meeting Shane, I realized this wouldn’t be like other guided walks I’d experienced. Shane combines farmer smarts with worldly wisdom, encyclopedic knowledge with a quick wit. After orienting us to our location, he started up the hillside at a quick pace, easily navigating the uneven terrain. The pace was comfortable, but the footing required constant awareness so as not to stumble over loose rocks, twist an ankle in a fissure, or slip on the dung. 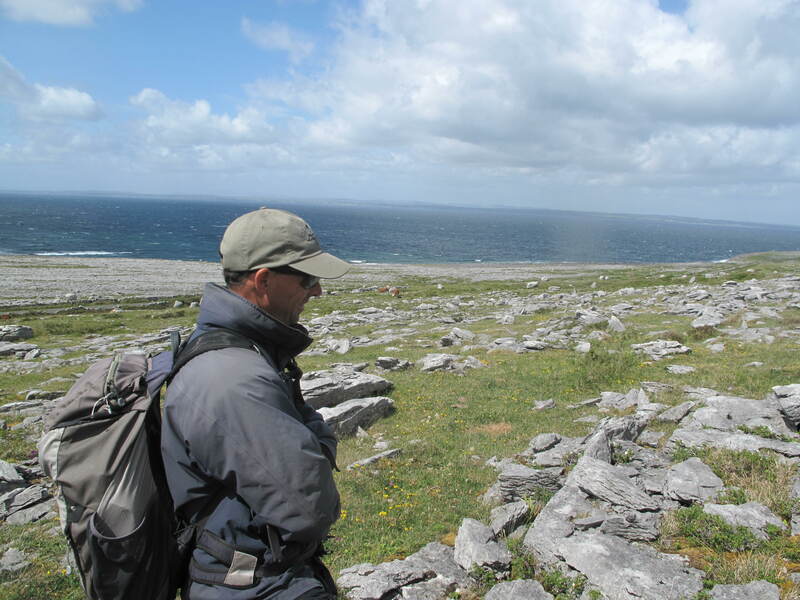 We stopped after fewer than five minutes of walking, and Shane began to explain The Burren’s landscape. 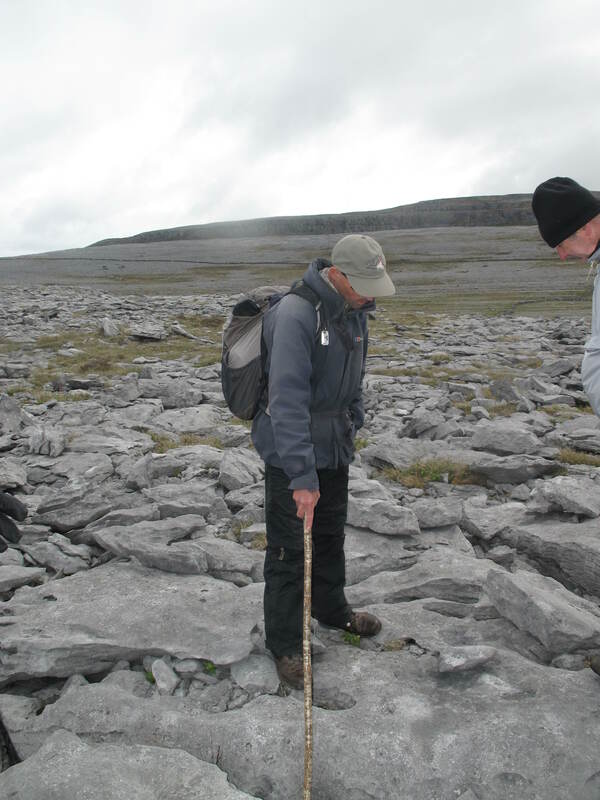 “Three-hundred-sixty million years ago, The Burren was covered by a tropical sea. At that time, Ireland looked like the Great Barrier Reef of Australia. That’s what we’re walking on right now, ancient seabed,” Shane said. Shells and skeletal remains of sea creatures formed the limestone. “If you turn over a rock, you’ll see the fossils.” As I pondered that, he jumped forward 40 million years. “Ireland became a delta. That gave us a different type of rock, shale and the granite in the Cliffs of Mohr,” he explained. Tectonic movement raised the landform into a plateau, then glaciers scoured it, leaving behind the rounded terraced hillsides that now appear paved with limestone cobbles. “Do you know the story of Noah and the ark,” Shane asked, as a light rain began falling. I nodded yes. “Noah invited an Irishman onto the ark. When the Irishman asked why, Noah told him it was going to rain for 40 days and 40 nights. 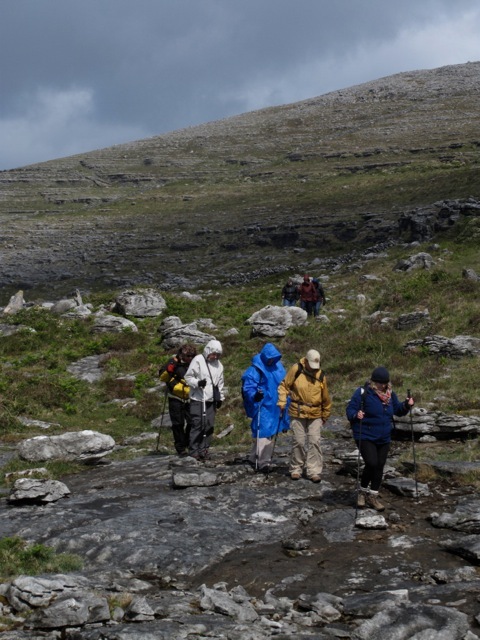 The Irishman said that was only a shower.” He flashed a grin, and we continued our ascent, playing hopscotch on the limestone pavement and clambering over stonewalls. There was no trail that I could discern. The raindrops disappeared almost as quickly as they fell. “Even though Ireland is a wet climate, there are no rivers here, no lakes. All the water is underground,” Shane said. As water seeps down and around, fissures in the limestone deepen and widen. “Underneath The Burren are caves. You’re walking on a sieve.” When the rain is heavy, the caves overflow into turlochs, an Irish word for dry lake. Shane stopped again, cocked his head, and asked, “Hear that?” I heard nothing but the ever-present wind. “That was a coocoo, maybe we’ll hear it again.” That provided a segue into talking about wildlife. Until 8,000 years ago, there was a land bridge between Ireland and England, and most of the plant and animal life came across it. Despite what the Bishop says, St. Patrick didn’t drive the snakes out of Ireland, they never arrived, Shane quipped. 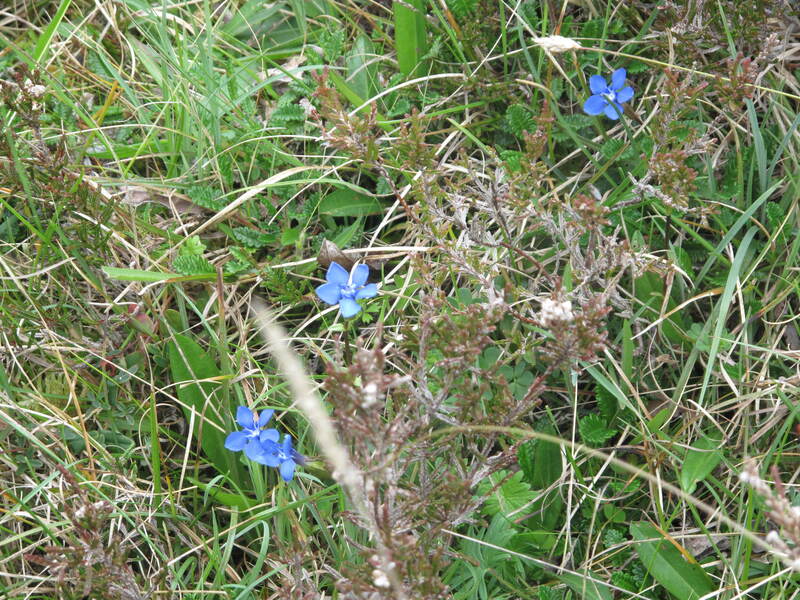 Many of The Burren’s plants are rare and seemingly far from their native habitats, and there are people who travel here just to see them. Theories abound as to how plants common in the Mediterranean, the Alpine, and the Arctic not only arrived, but also survive here. It’s easy to suppose that seeds were carried here by birds or upon the winds or even by man, but botanists point to glacial movement and climatic changes as the more likely causes. As we climbed higher and higher, the views began to open up and divert my attention. Connamara beckoned across the sunlight-and-cloud dappled waters of Galway Bay, and the Aran Islands salted the western horizon, where the bay merged with the Atlantic. One benefit of hiking in a landscape devoid of trees is that there’s nothing to interrupt the views. Shane interrupted my photo spree and refocused me on a small circle of stones. “That’s a cow dung enclosure,” he said. Because there were no trees, dung was collected for use as fuel. 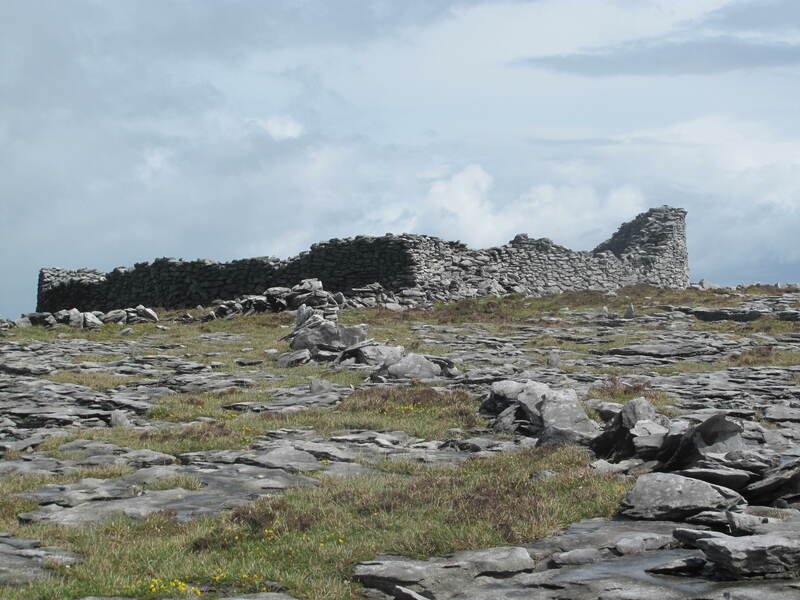 Human’s have lived in The Burren for at least 6,000 years. To place that in perspective, consider that nearly equal amounts of time have passed between the construction of one of the last megalithic tombs built here and the birth of Christ as have between Christ’s birth and the present. 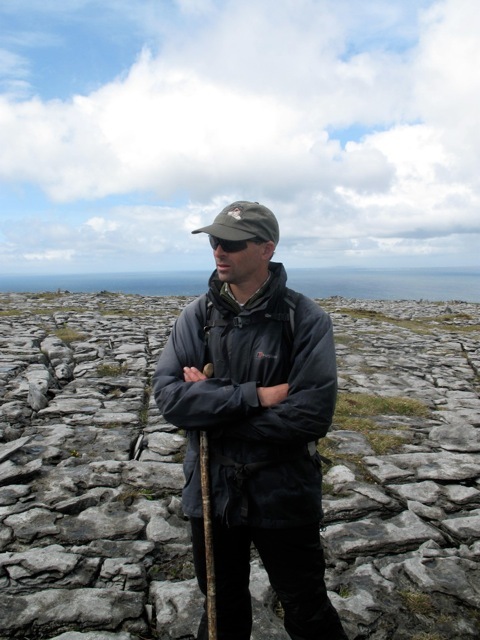 Shane said that the pastures and the gnarled inland forest are a reminder of how The Burren looked before man arrived, felled the trees and turned cattle and sheep loose to graze, eroding the thin layer of topsoil. The Burren must be a difficult place to eke out a living as a farmer, but people do and seemingly always have. Between and below the rocky highlands, farmers have patched pieces of the unforgiving landscape into a quilt of green pastures stitched with stonewalls. “We have a system for feeding livestock all year round naturally. As a farmer, I have plenty of techniques to winter livestock today. The generations before me had none of them. They had to rely on nature.” Because limestone is a warm rock, Irish farmers could pasture their sheep and cattle in the highlands in winter, and in the valleys during the summer. During Ireland’s Great Famine, more than 880 people live in this area, but according to the last census, now only around 140 do. As man’s footprint on the highlands has diminished, trees have begun to return. “Limestone is alkaline, and rain is naturally acidic,” Shane said, adding that glaciers left behind striations in the rock. He pointed to pocket of green, where grass was growing and small trees had taken root. “It’s a slow system. What’s happening is our generation is the little tree, the thorn, hawthorn, hazel, and willow are taking root. Next comes ash birch, and sycamore,” he said. I tried to picture a homey scene, but shuddered at the thought of shacking up in this isolated enclosure with three generations of family as well as livestock, subject to the ever-present wind and the all-to-frequent rain. When Shane said it was time to head down, I followed, ready to return to the comforts of Gregans and knowing I’d earned my dinner.